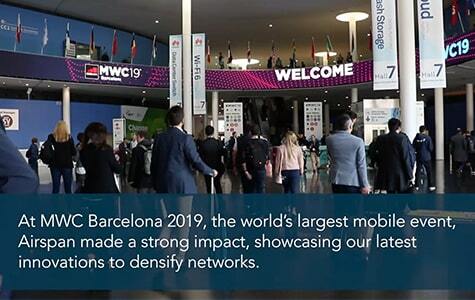 MWC2019 was successful for Airspan Networks as a number of new innovations were introduced. • The launch of Airspan’s Air5G platform capable of delivering in excess of 6.5 Gbps with support for mmWave and Sub 6 Ghz. • Next generation products that support 5G NR relay backhaul using Qualcomm Snapdragon X50 Modem. • Showcase of AutoAir, a hyper-dense 5G network for Connected Automated Vehicles (CAV’s) delivering in excess of 1 Gbps at 160 mph. • Launch and demonstration of AirSky A2G that provides high-speed, low latency, in-flight connectivity. • Introduction of iBridge Fixed Wireless portfolio that offer cost-effective, gigabit speed, carrier-grade PTP/PTMP solutions.